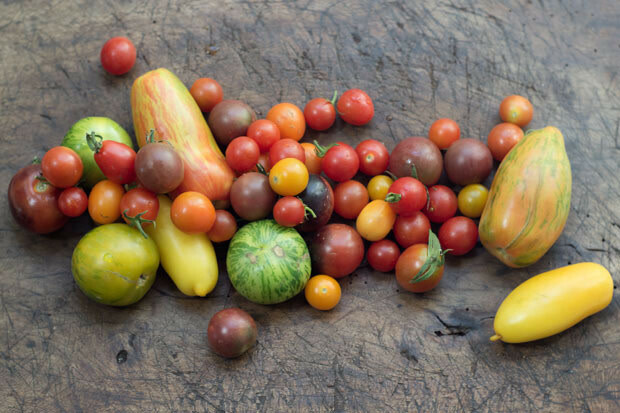 Heirloom tomatoes come in a wide variety of color, shape and taste, but all of them trace back to a handful of seeds. An informal survey of Portland’s home gardens this summer proves a near miracle has occurred: tomatoes are doing well! Usually even expert backyard gardeners in our region admit to having troubles with tomatoes, because they—the tomatoes, that is—need extensive, hot sun. But this year, the past weekend notwithstanding, we’ve had plentiful days without rain plus stretches of 90+ temperatures. The tomato gods have smiled upon us. so it's time to summon the no-cook tomato salad recipes, especially panzanella, an Italian favorite. Panzanella is a traditional Italian way to use the remnants of crusty bread, though the first such thrifty bread salads were pre-tomato era, and thus depended on onion, cucumber and other vegetables tossed with olive oil and vinegar to revive the stale loaves. Tomatoes do an even better job, though, with their flavorful juices. It's time to head out to the garden (or the farmers market) and try this classic, unfussy panzanella recipe from Carlucci's in Chicago. Happy harvesting! Toss everything in a bowl and let marinate at room temperature for at least 1 hour. When ready to serve, toss lightly and check the seasoning. Divide into 6 bowls and drizzle a little extra-virgin olive oil on top. 6 servings.